I first encountered the phenomenon of “dream flying” during a field trip to Wiluna in January 1975. It was late December, the hottest time of the year, when I arrived at Bondini Reserve after a long arduous two day drive from Mt Margaret Mission. I was driving a truck loaded up with Aboriginal people and their belongings, who were attending the annual Nga-waji rainmaking ceremony at Bondini, an Aboriginal reserve settlement located about three kilometres east of the township of Wiluna on the legendary Gunbarrel Highway. Desert people from as far afield as the Docker River, Jigalong and Balgo were to be attending this event. I was accompanied on the trip by a Warburton Lawman who acted as my guide and informant during the journey to Wiluna. On the journey down Peter (an alias) seemed to be preoccupied with something that was troubling him. When I inquired what was wrong, he replied that he felt anxious that something had happened to a member of his family back at Warburton. When we arrived at Wiluna, Peter rang his community from the police station and received the news that his father was ill. He murmured something, which I found inaudible, that he would visit his father to check on his condition later. I thought, did I hear him say this because there was no way he could travel all the way back to Warburton that night, driving about eight hours straight over one of the most rugged roads in the world. I met him the next morning at about 8.30am at the Reserve where he told me that he had flown home the previous night to check on his father’s condition. I sceptically asked him ‘Is your father recovering from his illness?’ ‘Oh Yes’, he said. ‘He ‘s walking around now and feeling much better.’ It was not until some eighteen years later that I came across by chance another night dream ‘spirit flight’ phenomenon. This time I wanted to understand how one could achieve this extraordinary night-time mission. A conversation I had before the meeting with two senior Lawmen who identified themselves as Mapantjara shaman led me to believe that ‘dream spirit flights’ were almost as common as driving one’s car through the bush. All of the Lawmen interviewed stated they had no doubts that when a man dreams at night, he can direct his spirit towards his country and fly over that particular country and visit the place of his spirit conception ‘if he wants to.’ It was understood that in their dream spirit journey the soul leaves the physical body and can travel anywhere in their known world. Step 2: Sings the songs for that country – this can be achieved either sub-vocally or aloud for about an hour before sleep. Every word of that song is a mnemonic that triggers an account of Tjukurpa dreaming of that country. The song stimulates the narrative memory of the traveller and directs their spirit home to its ngurra. Step 4: A novice should travel with an experienced traveller or Mapantjarra. To psychically project oneself to a particular place, one must focus attention on a particular place, repetitively singing or chanting oneself into an altered state of consciousness. This technique of cyclical chanting and focused suggestion prior to sleep enables the entry into a lucid dream state whereby the participant experiences the realistic sensation of flying to their homeland. The most dangerous part of the experience is the danger of breaking the law by entering a forbidden territory or meeting a threatening ancestral being. 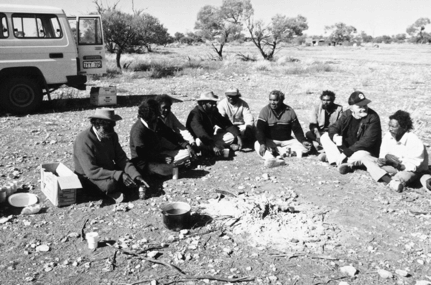 It is for this reason that novices must travel with a Mapantjarra (shaman) as their guide. *Note: Jimmy was originally from Munkalyi. At the time (1975) when I first visited him he was residing at a fringe camp in South Kalgoorlie with a group of elderly people who had also been born in the bush and drifted into the urban setting. Jimmy was in a relationship with one of the women from this group and practiced as an urban Mapantjara (shaman).